In this paper, a printed circuit board inspection system based on image processing and pattern recognition techniques is described. A novel lighting method is adopted to inspect the solder fillet. With this technique, it is possible to inspect chip with fine pins, such as 1005 and 0603 chips. A steepest descent algorithm is also developed for the image feature map matching computing. Based on the image learning function (optimal estimation), flow soldering of the dual-inline package can be inspected. And the technique can also be applied to Pb free soldering inspection. With the development of integrated circuit (IC) techniques, the electrical components become smaller while the flexible manufacturing systems are well adopted. The number of integrated circuit's pins increase and the size is getting fine. Automatic machines, such as inserter, and printer, are used. But there still needs people to inspect these boards visually. The inspect machine with the probes used before are not competent to the new requirements. Printed circuit boards (PCBs) are also inspected extensively before the insertion of components and the soldering process to isolate defects such as shorts, opens, over-etching, under-etching, mousebits, pad size violations, and spurious metals. Although a great deal of work has been done in the area of PCB inspection, very little research addressed the inspection of solder joints . The objective of inspection is to identify typical solder joint defects on PCBs such as missing solder, cold solder, excess solder, blowholes, voids, and solder bridging. And the mistakes of component insertion should also be inspected. Image processing and pattern recognition techniques play an important role in this area. The binary image can be drawn from the original one. By comparing the areas or the circumferences, the evaluation can be carried out. Another way is to compare the acquired image with the perfect one. The difference between the two images will help the judgment. And neural network can also be used for such purpose. The neural network should be trained by prepared patterns. But the computation is a hard work. So, we take the method of correlation. The process starts with imaging the object to be inspected by a sensor (or sensors) from which visual data are collected and sent to the processor for analysis. Features representing the object are then extracted and matched to a predefined model. The feature-to-model matching process is the most common technique for detecting defects. Figure 1 gives a schematic of the inspection system. A one-dimensional line camera is used to acquire the data from the reflect mirror. In order to characterize the solder fillet, a novel lighting technique is adopted (as shown in Fig.2). There are seven LED array boards in the lighting equipment. After the camera acquires a single line, the LED array switches from one to another, i.e. changing the illuminating angle. A linear actuator will move the PCB along the x and y directions. As usual, the width of the solder fillet varies from 30 mm to 50 mm and multiple pixels can be acquired from this area. But corresponding images acquired by the fixed or movable camera are all the same. So, if the line senor (here, the line camera) is applied and every (pixel) line is acquired at different illuminating angles, the corresponding image will be different as shown in Fig.3. In fact, this technique carries out an image fusion procedure. Other than fusing the whole image, it combines the (pixel) lines obtained at different illumination conditions into one image. This will save the time on computing the result by using certain image fusion algorithm. It is possible to inspect the fine pin by this technique. Fig 1: Schematic of the inspection system. 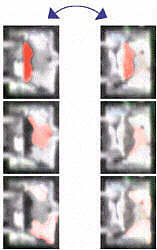 Fig 2: The illuminating method Fig 3: The different images obtained at different illuminating conditions. comparing the contour vector of the standard image and that of the acquired image. For an effective computation, a so-called steepest descent algorithm is employed for the image feature map matching. And an optimal estimation procedure is carried out for the inspection of the flow soldering of dual-inline package (DIP). To make judgment from the images obtained at different illuminating conditions, the fillet correlation should be obtained. And this can be done by two steps: first, computing the correlation between the standard image and the acquired image at every illuminating angle; second, computing the fillet correlation, i.e. the product of all the correlation values obtained at the first step (as shown in formula (1)). Finally, compare the fillet correlation value with the threshold. Fig 4: The evaluation method based on block correlation. Here, (Corr)n means the correlation value obtained at illuminating angle n and FC stands for the fillet correlation. If the fillet correlation value is under the threshold, the fillet is regarded as abnormal. For the fillet correlation is the product of all the correlation values. It is sensitive to the difference between the corresponding images. The procedure of computing the block correlation is given in Fig.4. Both the standard image and acquired image are divided into blocks. The correlation values between the corresponding blocks are calculated for the evaluation. The third method mentioned above is the evaluation from the edge map. Edge maps of both the standard image and input image are extracted. The difference between these two maps can be evaluated by the rotation and translation parameters. If two points on a line (x1,y1) and (x2,y2) correspond to the other two points (X1,Y1) and (X2,Y2), the rotation and the translation can be computed by formula (2) and (3) respectively. The threshold value qs and asare firstly set up by the operator. Firstly, the thinned-out standard image and the acquired one are compared by the evaluation function around the following area. And the maximum value is searched. Secondly, decrease the thinning out value to the half, i.e. D= D/2. The iterative operation is carried out until D= 1. By this method, a logarithmic decrease on computation can be achieved. In the above example, the eight pixels around the center one are involved in computing. In practical application, the number of the pixels around can be added or removed basing on the complexity of the image content. And the initial thinning out value can also be adjusted for different images. If the correlation value is less than the threshold, the computation near that block should be carried out again with the different initial thinning out values and different neighbors. extracting the parts with high cross-correlation value, which are achieved by a method similar to SDA. decrease the pixel number in the pick-up feature clusters. The matching operation will be applied to the feature images. The selection of A and B will finally maximize the matching result. The (4) will ultimately converge to the minimum value. where S is the reduction component; a is the mortgage parameter; N is the iteration times; and R is the random number. In this paper, a PCB inspection system based on optical-electronic technique is described. The novel illuminating method is adopted to inspect the solder fillet by computing the fillet correlation. The techniques for effectively analyzing the image are developed: the steepest descent algorithm and optimal estimation. With these techniques, the DIP can be inspected and it is possible for the inspection of Pb free PCBs.